Peanut Butter Fudge is the top pick at my house. My boys absolutely love this fudge recipe, and everyone goes wild for peanut butter fudge at any pot luck dinner. I do have to watch this dish if I’m taking it to a dinner. I took the lid off at one Boy Scout meal, and I saw a little dip all around the edge of the fudge. Hum. It was quite obvious that some little finger had sampled around the edges. I only hope the finger was clean that did that. The joy of raising boys! Fortunately the other boys (and parents) at the Scout gathering just overlooked this little obvious problem. I also began offering the pan for samples (like licking the bowl but using a spoon), so that it was not so tempting to secretly sample the fudge. That (and the lecture) appear to have worked. This recipe came from my sister. My guys loved it so much that I had to start making this at home. I emailed my sis and got her to send her recipe over. She has a lot of good recipes, and she is always good about sharing. Thumbs up to my sister. Put the butter in a large size pan on the stove top. Let the butter start to melt and then put in the milk and sugar. Heat on a high medium until it's boiling lightly (but not popping out and burning your hand) and then boil 5 minutes. Time and make sure you’re close to the 5 minutes. Don't have the heat too high (or you may scorch the mixture and also make the fudge too dry). Stir while boiling. This is really the only labor intensive part. Pour in the peanut butter chips and then pull the pan off the heat. Stir until those are melted in or close. You stir more later, so it does not have to be totally mixed even. Add the marshmallow cream and vanilla. Stir until this is well mixed. This is when you want to mix well. Pour the mixture into the pan or casserole dish that you have ready and waiting that is sprayed with Pam. You’ll probably want to wear oven mitts. The mix is pretty hot, and most pans will also be hot at this point. The toppings are not critical (plain peanut butter fudge is fabulous), but they do add to the taste and also to the look of the dish. You’ve got to put those on immediately, or they will not stick. 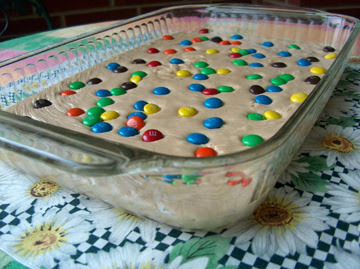 Once you pour the fudge in the pan, sprinkle the M&Ms or chocolate chips on top. With your hand, lightly press them down so they stick and stay on the fudge. This is just a tap-tap thing. I thought once that I would add the M&Ms in before pouring the fudge out. I put them in the hot pan with the fudge and stirred. They melted, and I had psychedelic fudge. The M&Ms melted, and make strange tie dye streaks all in the fudge. It did not hurt the taste, but it did not look so pretty like that. So, I will warn you on that one. Let the fudge set (harden up) and then cut in squares. It's pretty rich, so small pieces are the best bet. I do them a bit larger than standard size dice. You can, if you like, cut them like brownie squares. But, that’s a lot of sugar for one serving. I think my sister stores her peanut butter fudge in the refrigerator, but I’ve never done so. We like it room temperature. If you use air conditioning or if it’s fall through spring, then this keeps fine on the cabinet. I never make this on rainy days. It may be my imagination, but fudge just does not set up with too much moisture in the air. It’s OK when cloudy, but if it’s raining, I wait to make the fudge. If you cut and store this treat, then put pieces of tin foil between layers of fudge. It can stick together if not separated. It’s not a huge deal, but the layers with foil do help.